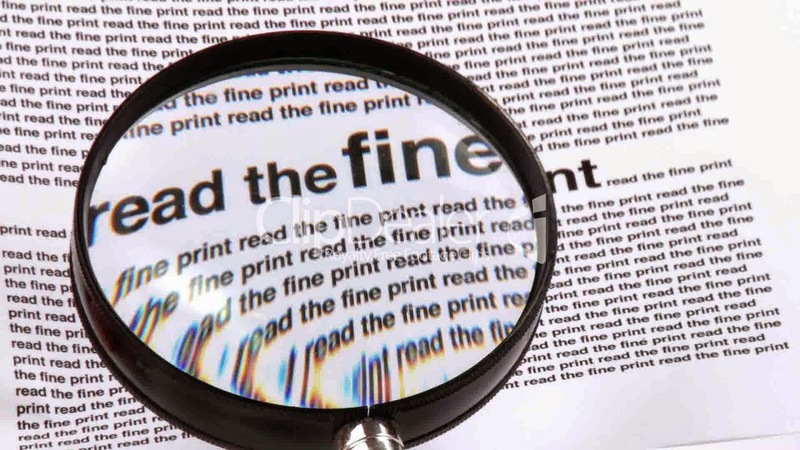 If you look down at the bottom of virtually every car advertisement in your local newspaper, Internet or direct mail advertisements, you will see some fine print. Sometimes you literally cannot read the print because it is so small. There’s always fine print in TV advertisements too, but it’s so small and flashed on the screen so fast that it’s impossible to read. The disclaimers you read below were taken from the PB Post. I didn’t make any of these up. Basically what these disclaimers do is to totally negate the validity of all of the prices and payments the car dealers are advertising. The prices and payments are always much higher when you factor in the almost invisible fine print. Combining a very short lease term with a high down payment: Nothing sells cars like low monthly payments. A car dealer can make a monthly lease payment as low as he wants by both reducing the number of months of the lease and increasing the down payment. I’m looking at an ad in the PB Post right now advertising an SUV for $19,999 or just $199 per month. In the fine print it says 27 month lease and $3,000 down plus a $799 dealer fee. "Plus dealer installed options": The price you see advertised in the paper is not the full price. This loophole allows the dealer to tack on thousands of dollars in overpriced accessories to the price that was advertised. "With approved credit": The lease payment or purchase payment you see advertised is based on someone with very, very good credit. Sometimes the ad will specify a minimum Beacon score of 750 or even 760. An almost negligible percent of people have a credit score that high. This payment gets you in the door and then they tell you your credit isn’t good enough to qualify for that payment. "Advertised offer good on select in-stock vehicles only": Dealers often advertise just one car at a price below their cost. They don’t pay the salesman a commission if he sells that vehicle. The chances of that car being available for you to buy are “slim and none”. Even if the car was still there, the salesman would do everything in his power to sell you a different car that he could earn a commission on. "Owner Loyalty Rebate": Manufacturers offer special cash rebates to current owners of their car. These rebates are not available to you if you don’t currently own that particular make of car. For example, if you own a Honda, and want to buy a Toyota, you don’t qualify for a Toyota loyalty rebate. That price you see advertised won’t be available. "Conquest Rebate": The inverse of the Owner Loyalty Rebate. In this case you are required to trade in a vehicle of a different manufacturer than the dealership's. For example, if you wanted to buy a Mazda, you would be required to trade in a non-Mazda. Here's the crazy thing: many dealers indicate that they require BOTH loyalty and conquest rebates in the fine print! How is that possible? "Price …plus, tax, tag, and fees": The red flag word here is “fees”. The fees these dealers refer to is a “dealer fee” which is synonymous for dealer profit. Most people think it’s a federal or state tax of some kind. It’s nothing more than more money for the dealer that is not disclosed in the price of the car. "Offers expire date of publication or may be cancelled at any time without notice": This simply means that the prices, payments, etc. you have read have no validity whatsoever. The prices are not good tomorrow, but they aren’t even any good today because the dealer can cancel the offer without notice. "Not responsible for typographical errors": This is just one more way for a dealer to explain why they can’t sell you the car for the advertised price…We don’t have to honor that price because it was a “typographical error”. "Vehicle Art for illustrations only": This means that that car you are looking at with the really great looking wheels might not have those wheels on the one you buy. Or, maybe it doesn’t even have that sunroof you see in the picture. "Minimum trade based on dealer list price": The dealer list price is not the same thing as the manufacturer’s suggest price. Dealers add markups to the Monroney label also known as MSRP or manufacturer’s suggested retail price. They label this markup (often on a sticker designed to imitate the official federal Monroney label). Dealer markups of $3,000 and much more are common on such “counterfeit Monroney” labels. In this case, the dealer has marked up the MSRP far enough so that he can offer a minimum $10,000 trade-in allowance. My advice to you is to ignore all car dealers’ advertising. Most car ads are designed to “get you in the door” so that they can sell you some other car than the one advertised so that they can make more money. If you must respond to a dealer’s advertisement, please be sure you break out your magnifying glass and carefully read the fine print. I’m looking at a used car ad about a special one-day sale in the newspaper that, by the time you read this column, will have taken place. Claim: The dealer is forced to sell used cars for $9 because he is overstocked. Fact: If a car dealer was overstocked with used cars he would not sell them below his cost and no used car costs as little as $9. A car dealer can sell a junk car that won’t even run for $150 just for the scrap metal. Claim: We can afford to sell used cars for $9 because we are a large volume dealer. Fact: No matter how large a dealer is, he cannot afford to sell his product below its cost. Claim: You are asked to pick out the used car you want and then “sit behind the wheel”. Only then will you be given the discounted price. Fact: This is a tactic invented by a promoter who charges dealers to put on these sales. This tactic is meant to instill irrational excitement in the mind of the potential buyers. The promoter will have a fast-talking pitchman with a bull horn trying to whip everybody into a buying frenzy. He goes from car to car “ripping” the old price sticker off and showing the new price. One thing that keeps people sitting behind the wheel of their chosen car is the hope that it is a $9 car. Fact: There is no such thing as a quality used car for $9. You would be lucky to find one for as little as $5,000. Claim: “After 1PM Saturday, all cars will return to their usual prices. Fact: You can buy any used car from that dealer (except the two $9 cars) for the same price that they were advertised for in that sale.